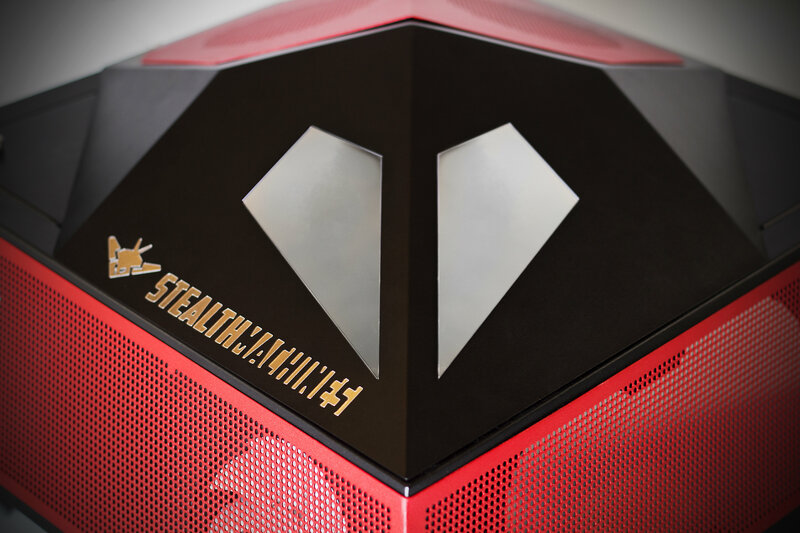 The NightHawk was designed, engineered, and manufactured in-house by StealthMachines. 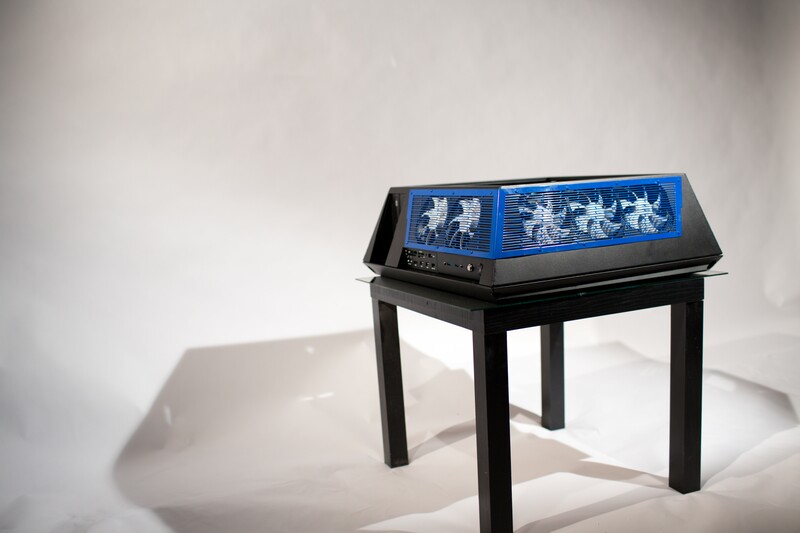 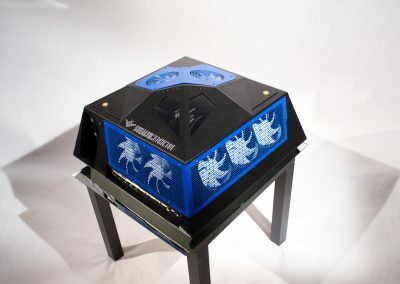 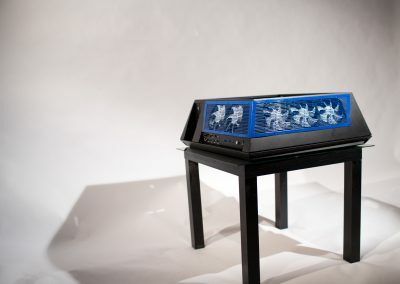 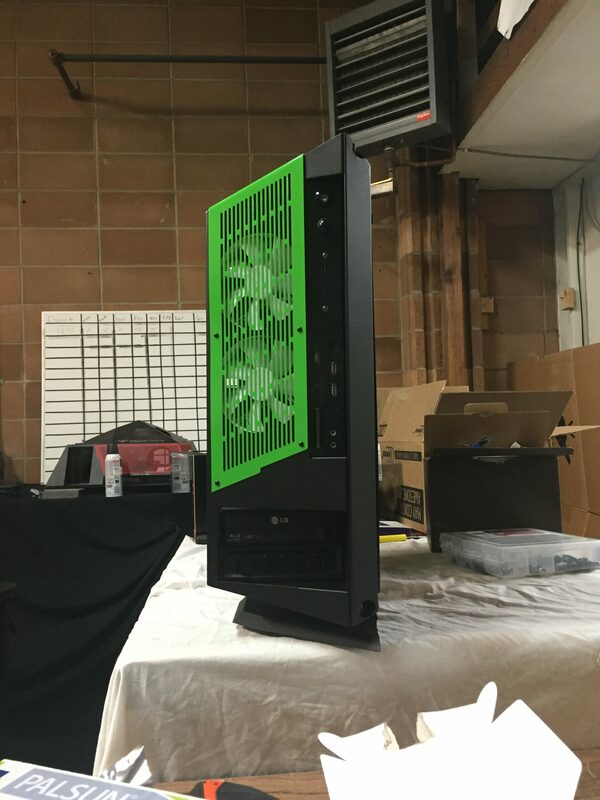 You cannot purchase this one-of-a-kind computer case anywhere else on earth, because it is OUR creation. 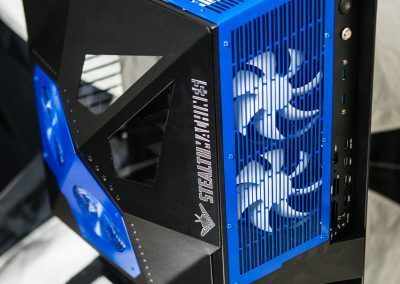 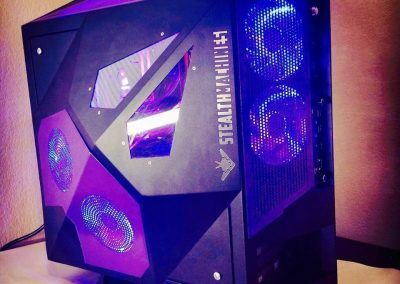 If you’re looking for a sleek new computer case to hold your power-house of a computer, search no more… The Night Hawk 2.0 will do the trick! 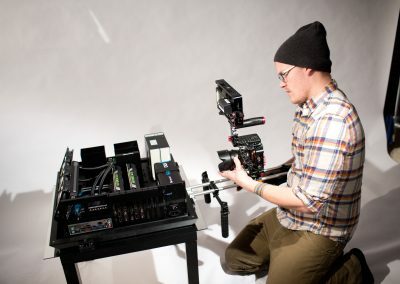 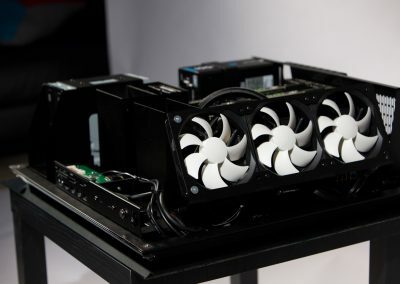 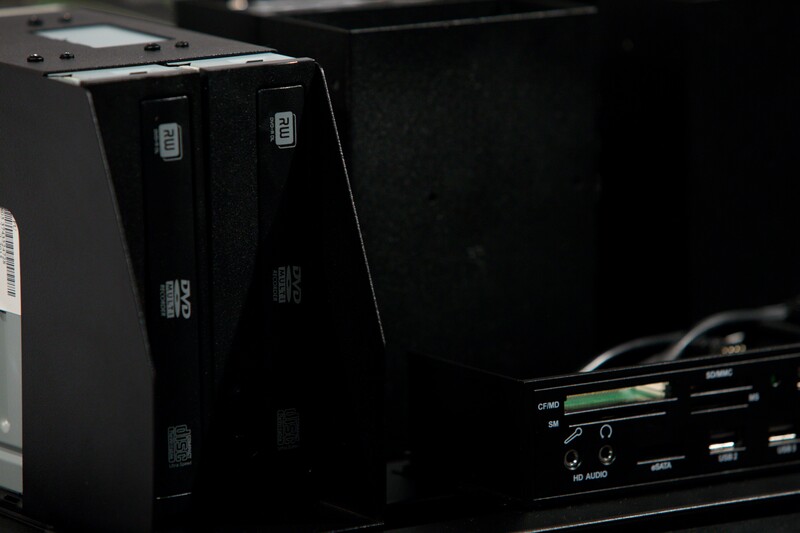 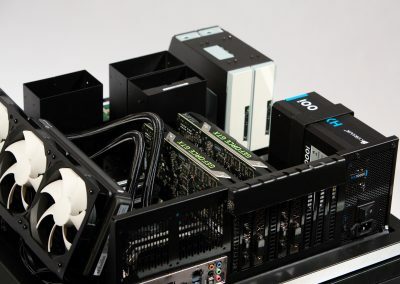 The NightHawk is the world’s smallest EE-ATX form factor computer chassis. 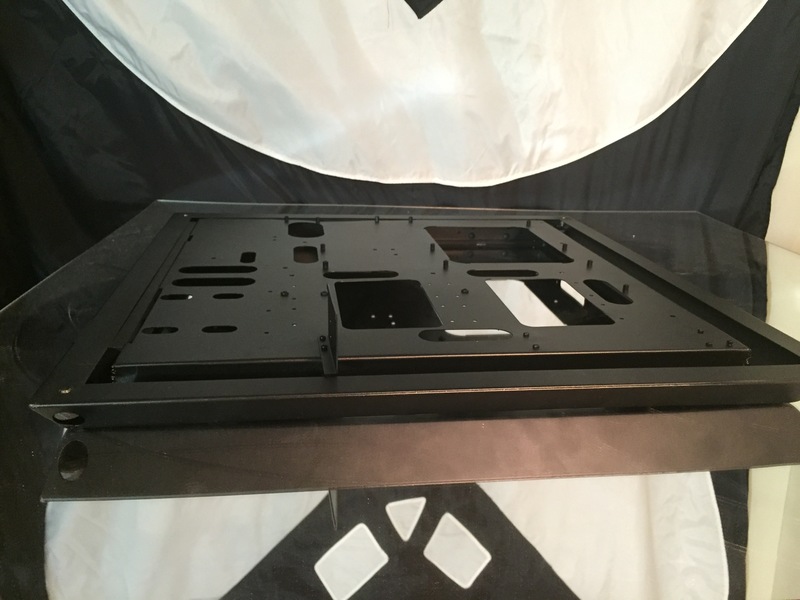 This means it will hold literally any part you want while fitting inside of the cozy space of 21.72″ x 23.36″ x 7.86″. 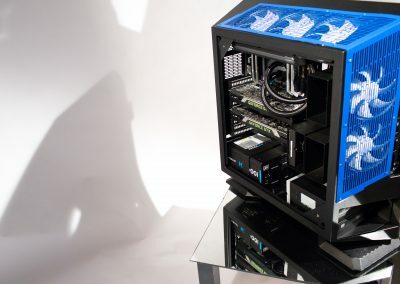 The entire computer is completely modular. 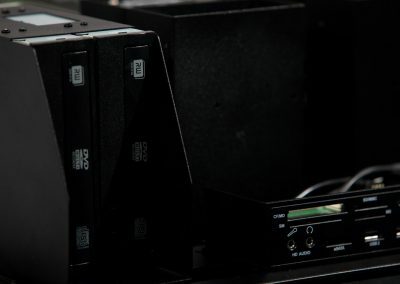 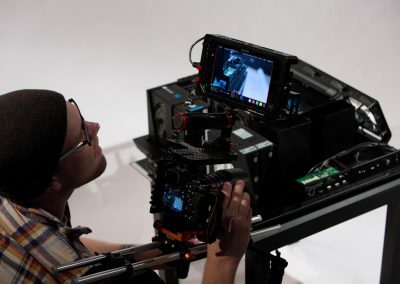 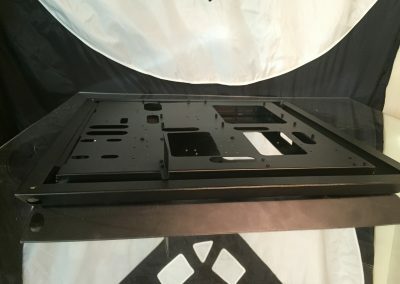 Everything from the hard drive bays, to the liquid cooling bracket, to the cover itself and literally everything in between can be added or removed to your liking. 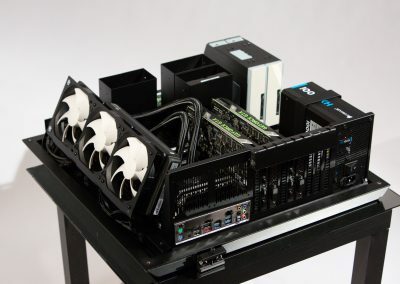 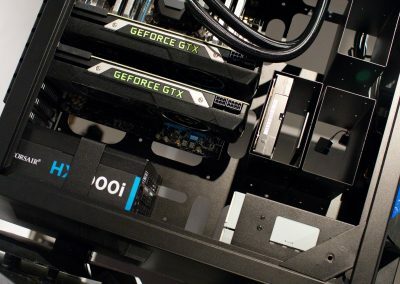 If you were to remove all of the modular attachments, the NightHawk would be reduced to a flat frame, allowing modders to re-imagine what is possible as well as future-proofing your computer for decades to come. 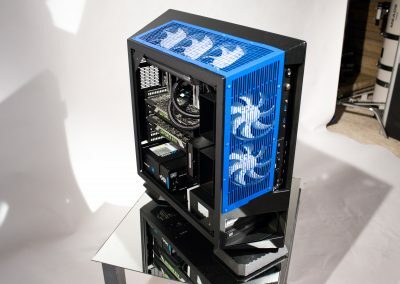 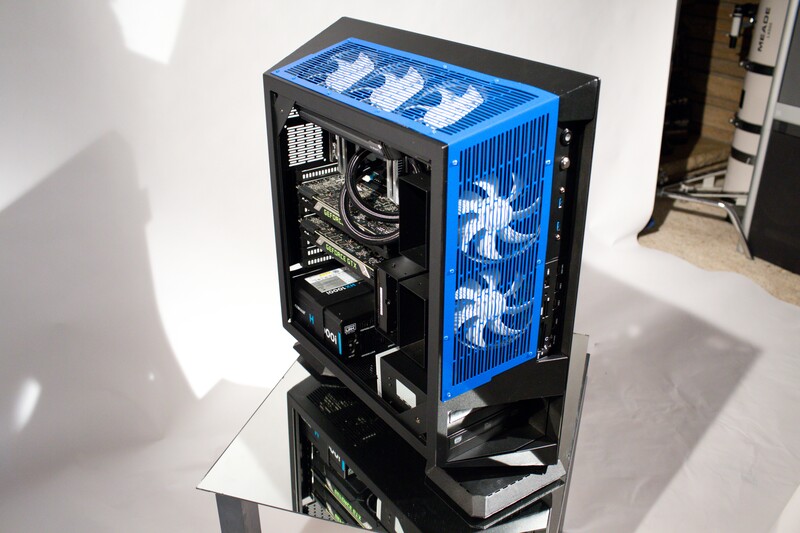 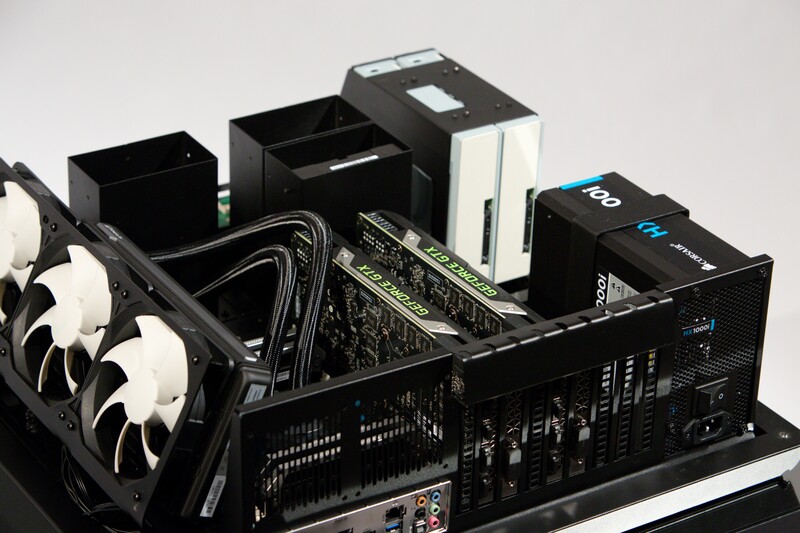 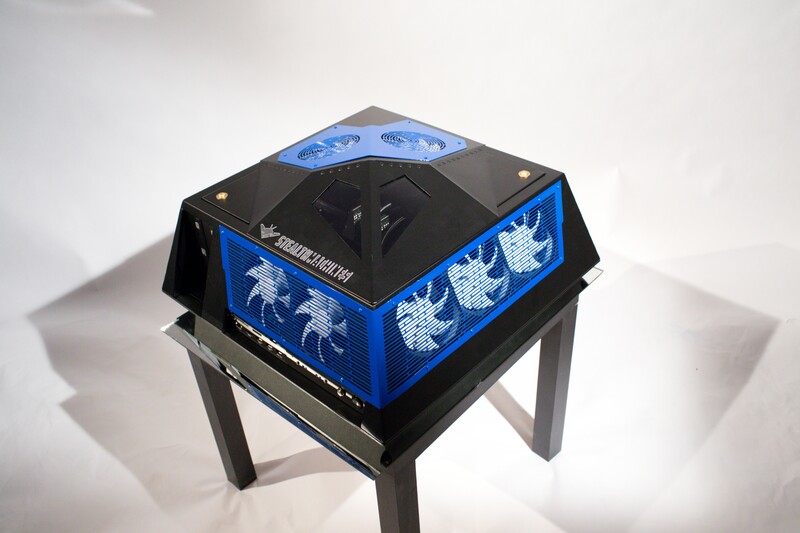 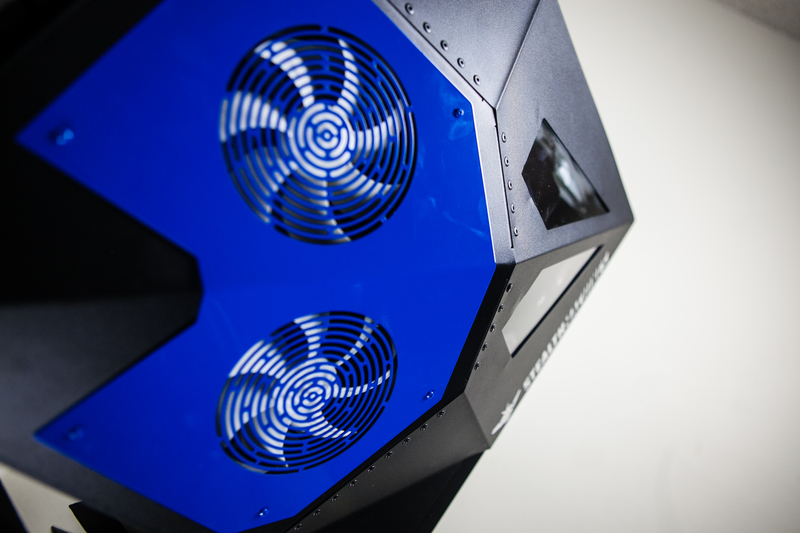 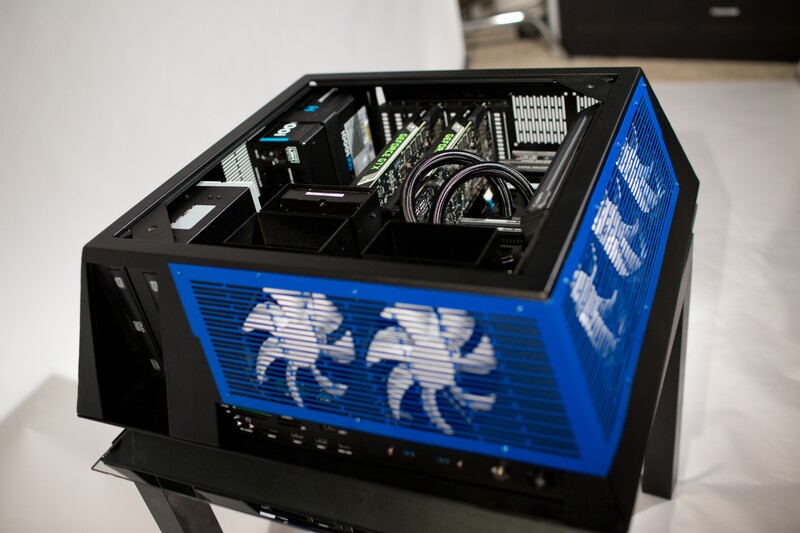 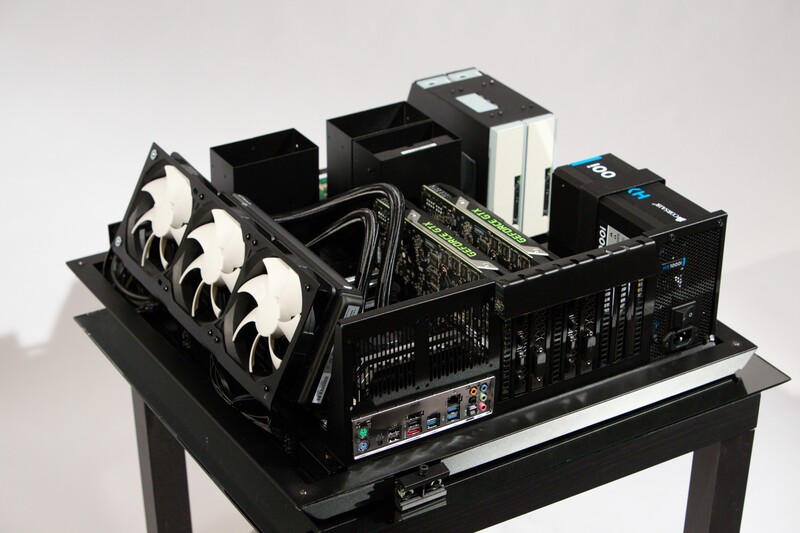 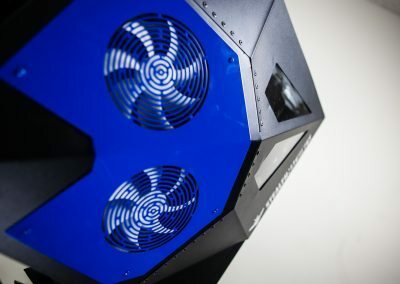 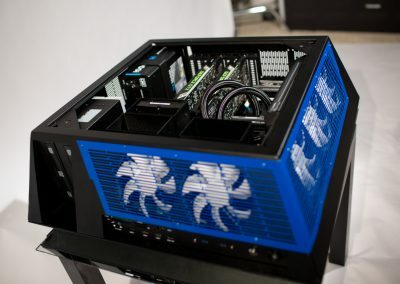 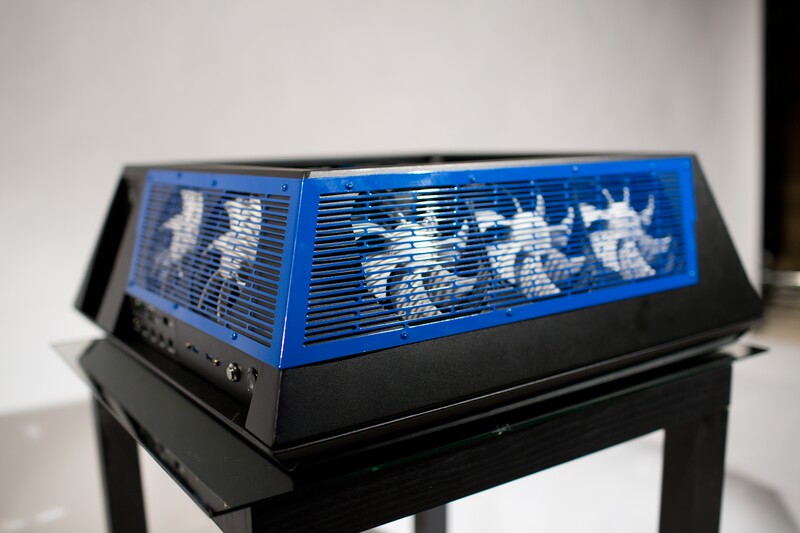 The case itself can hold up to seven 120mm fans and an additional two 80mm fans on the backside of the motherboard. 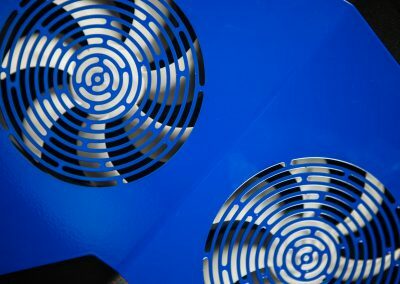 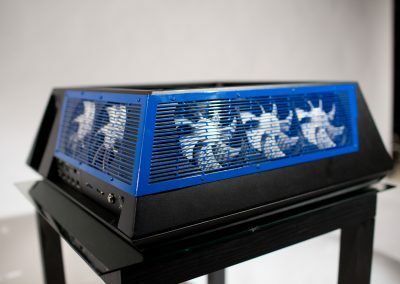 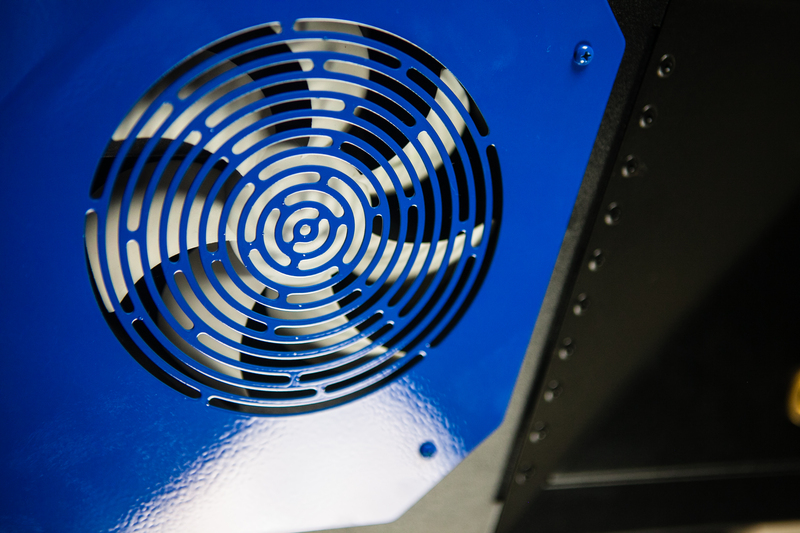 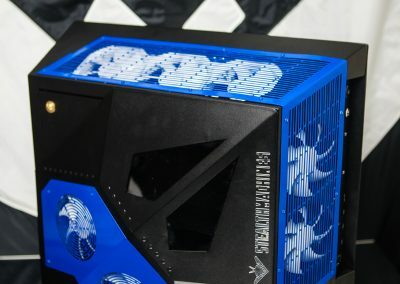 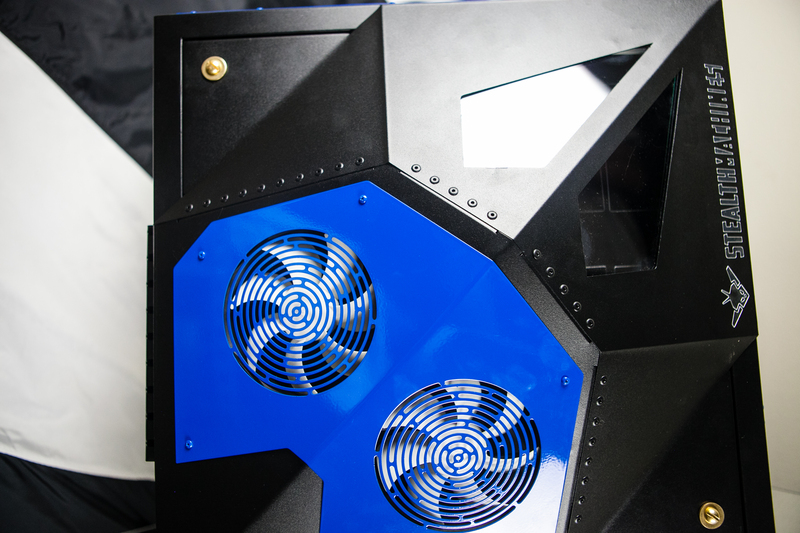 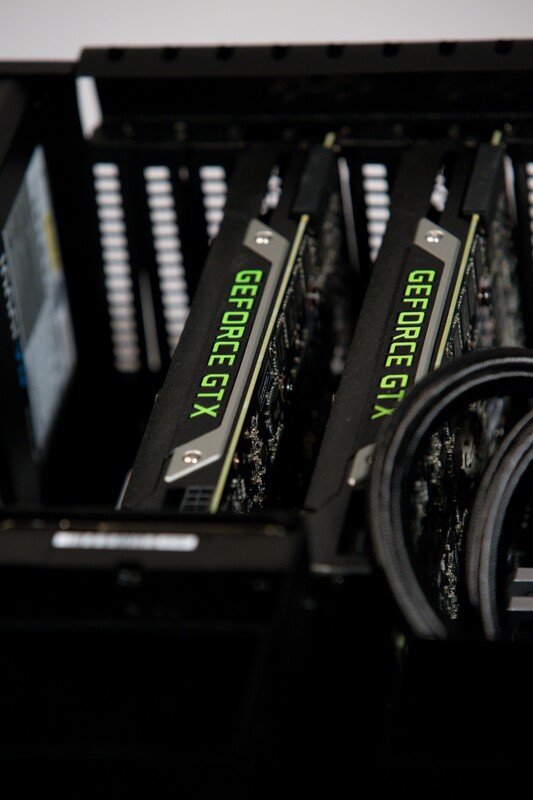 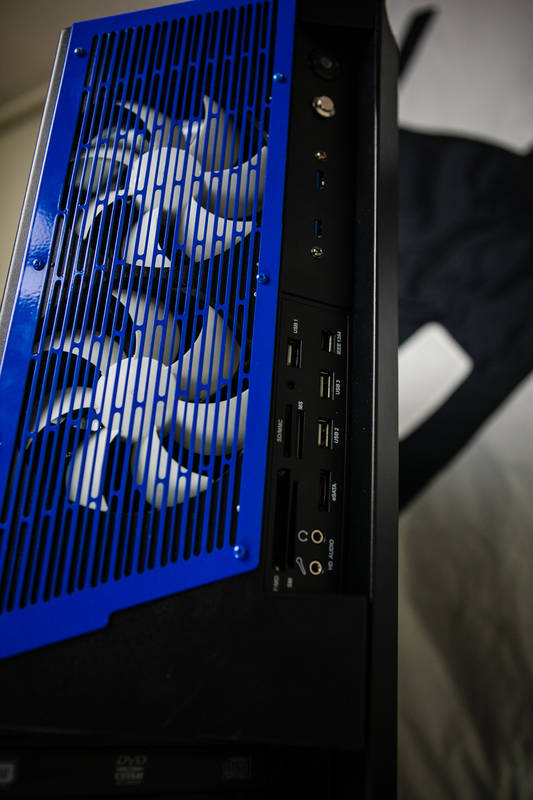 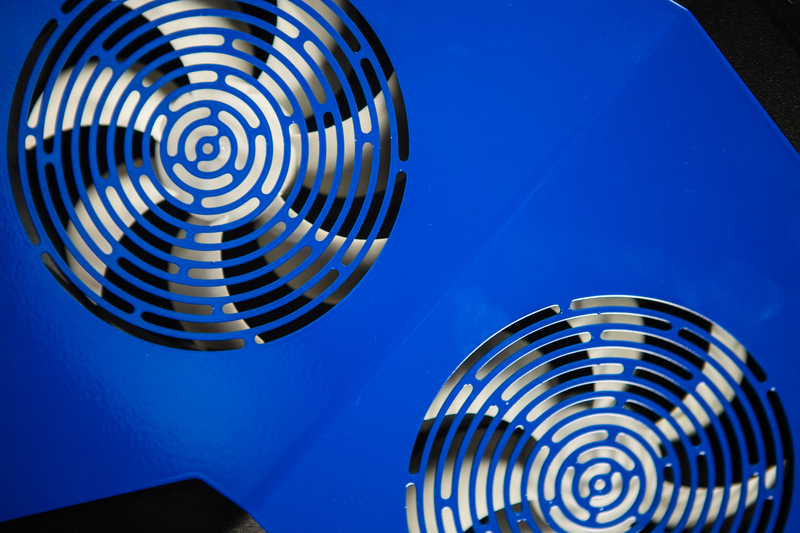 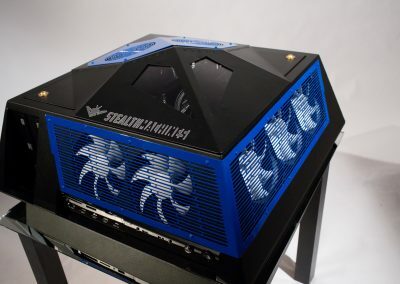 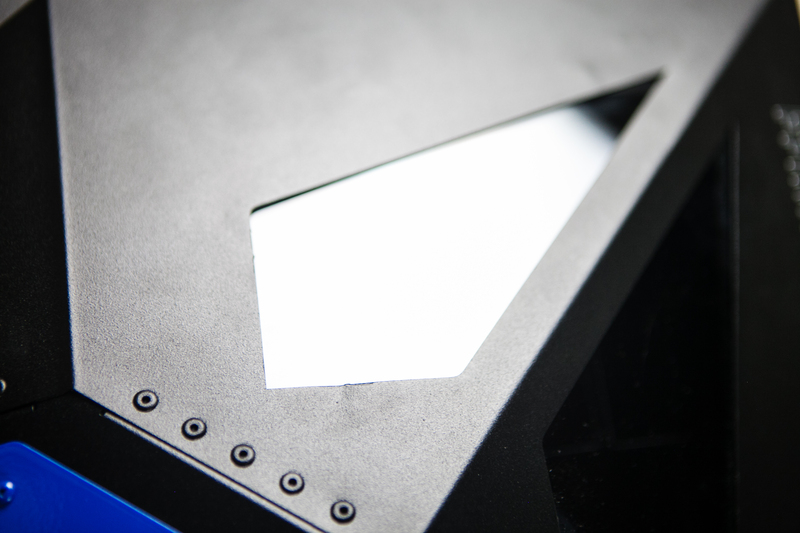 The fans can be seen through a steel mesh layer that has been custom painted for a flight like feel to the case. 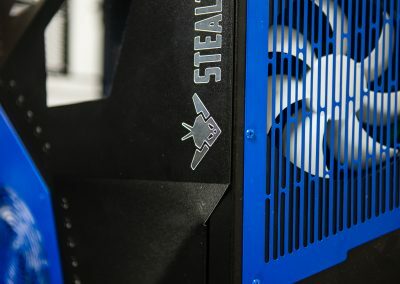 Because of the NightHawk’s all sheet metal design with 100% modular attachments, any modder’s creation can be juxtaposed directly onto the base frame, allowing the incorporation of some, all, or none of the StealthMachines-provided attachments. 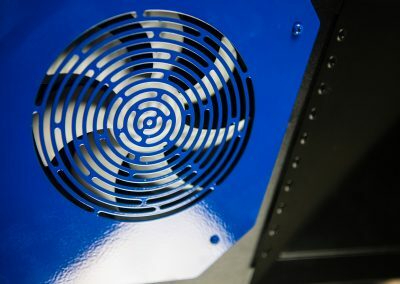 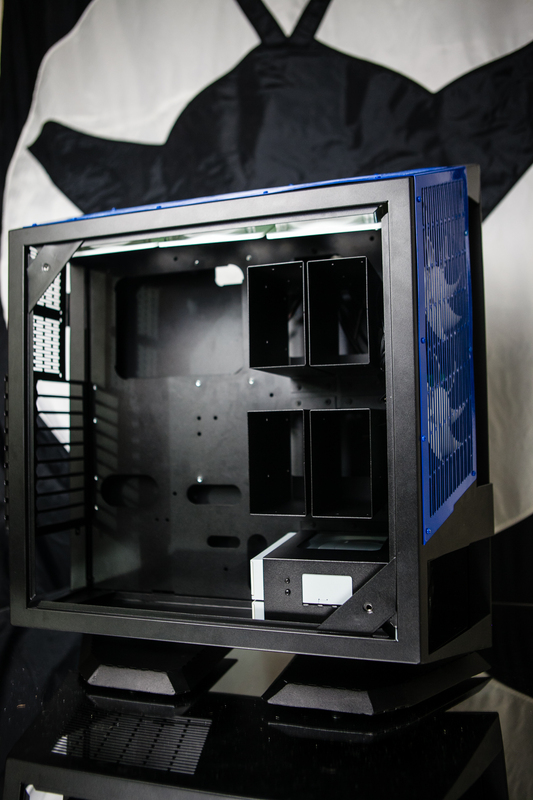 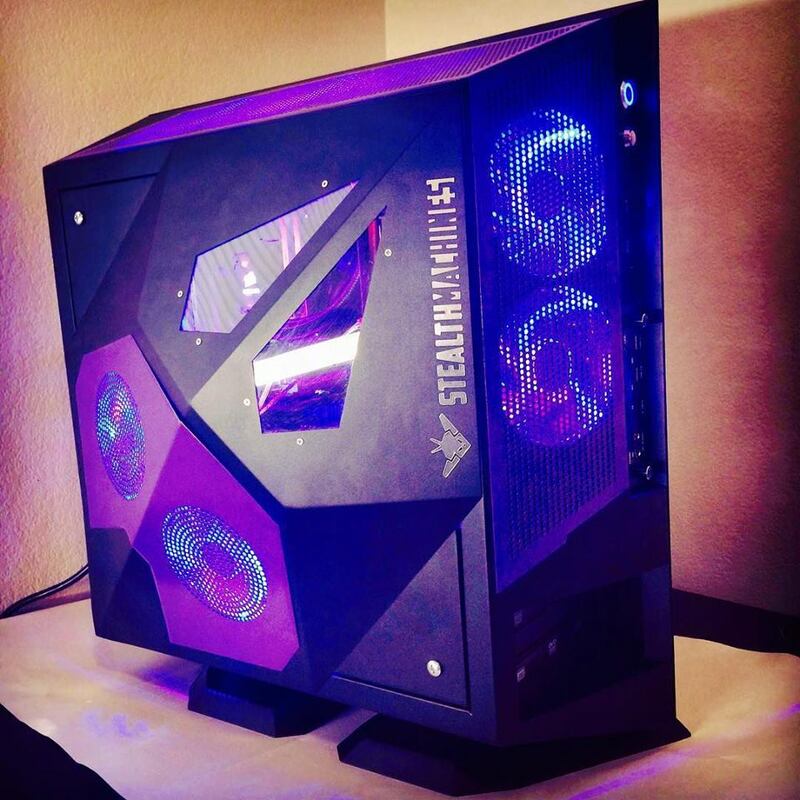 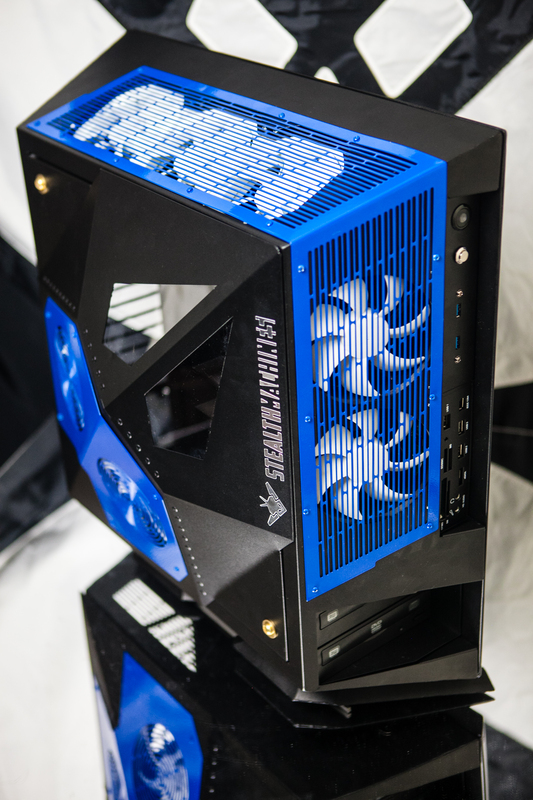 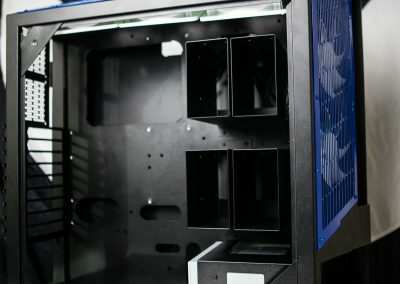 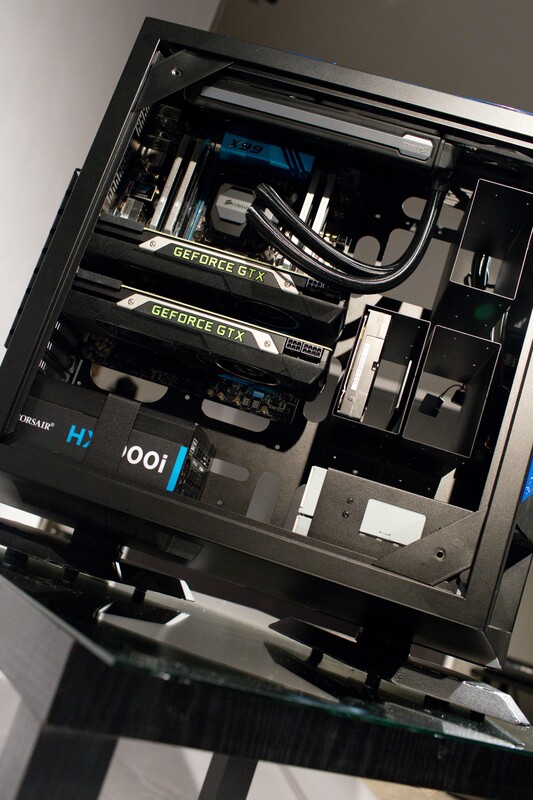 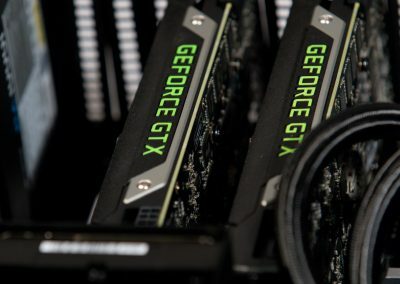 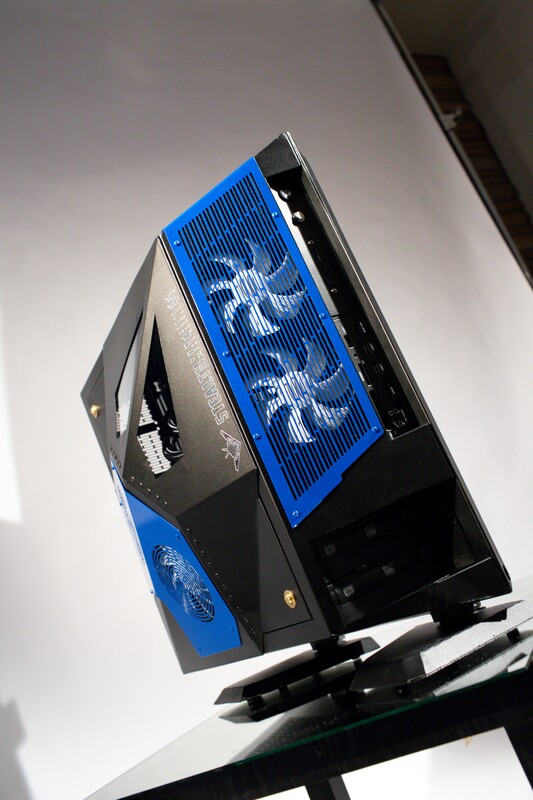 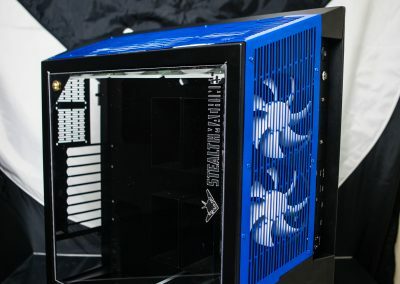 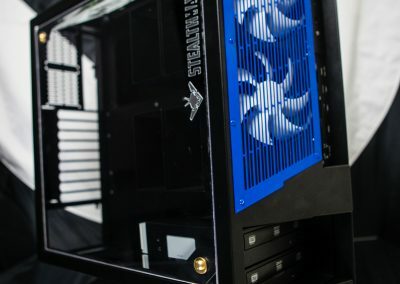 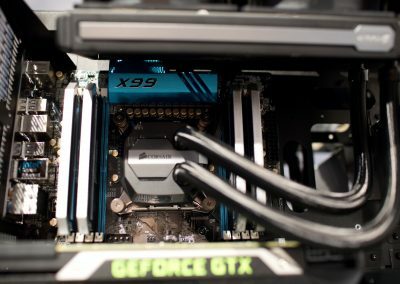 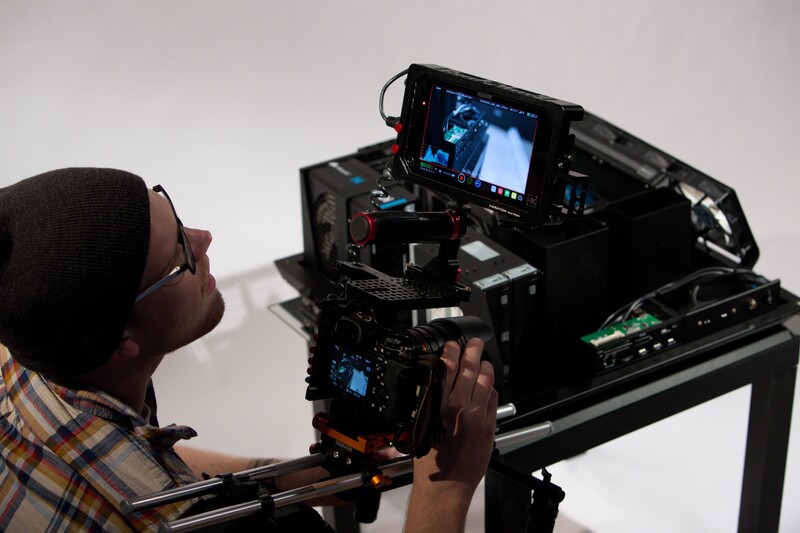 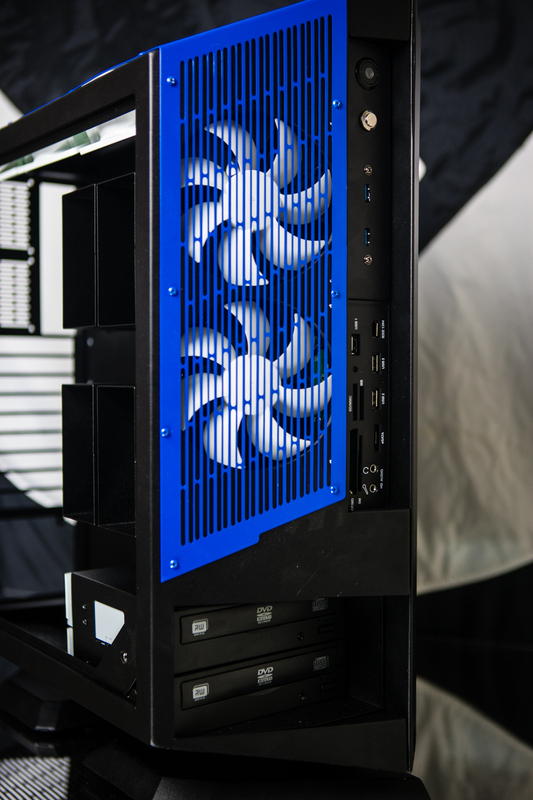 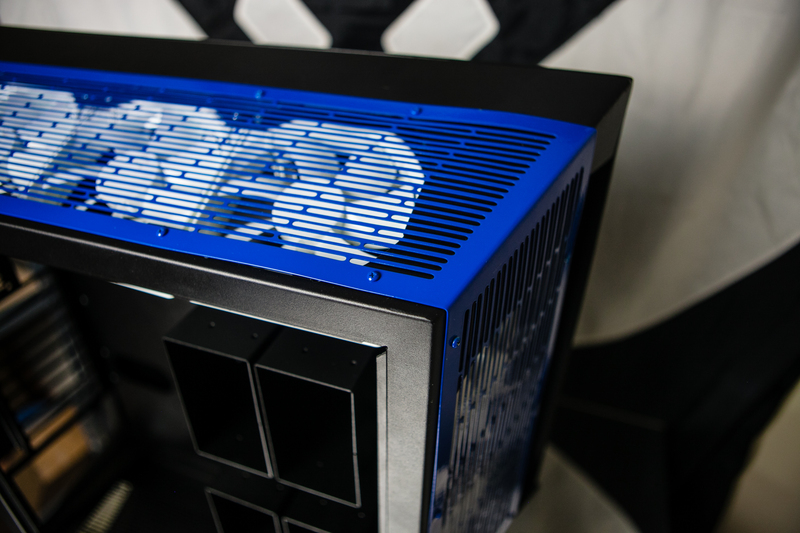 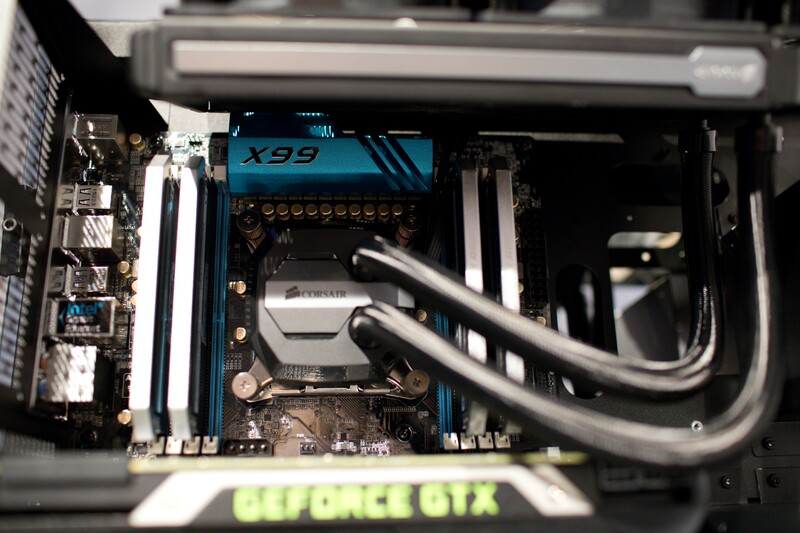 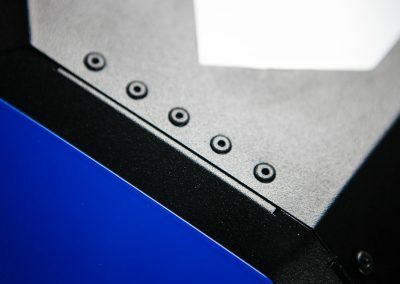 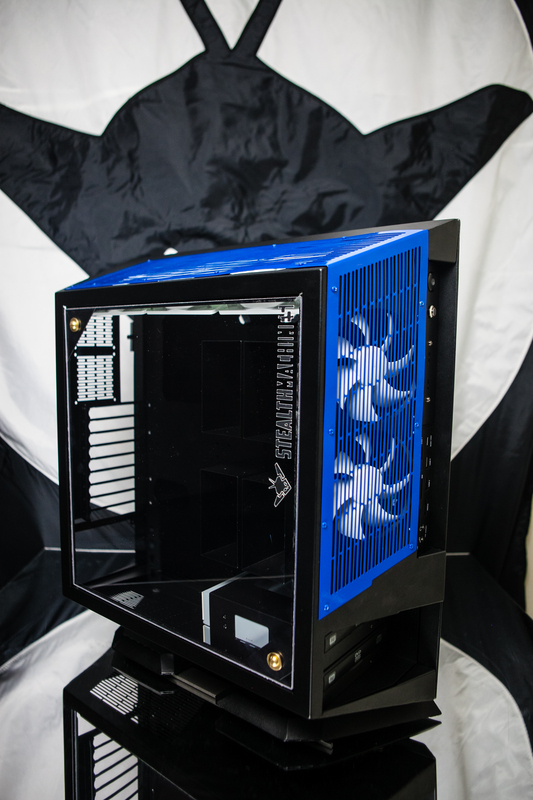 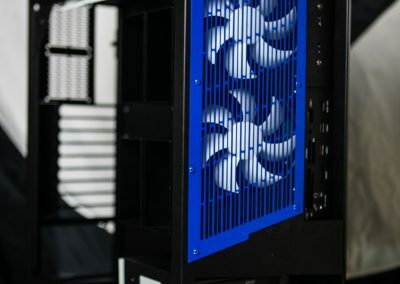 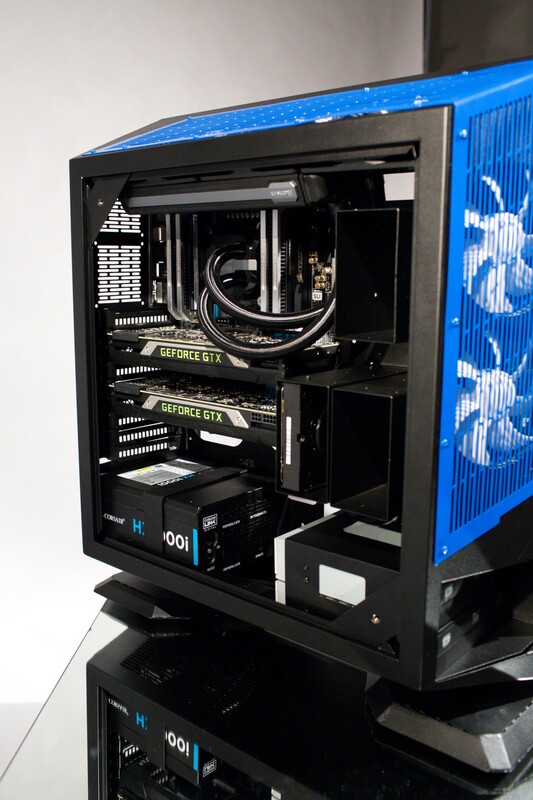 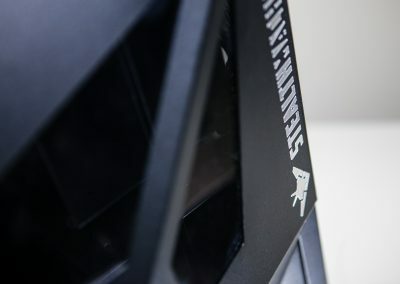 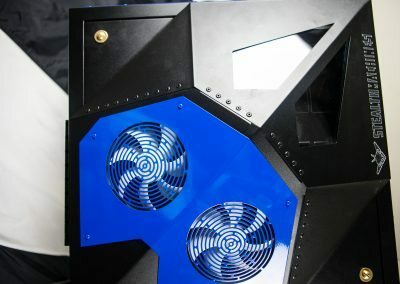 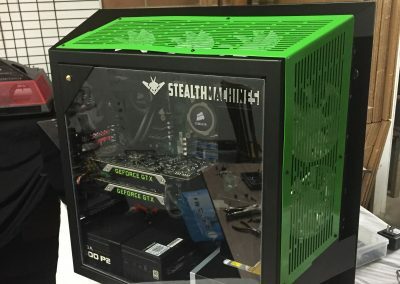 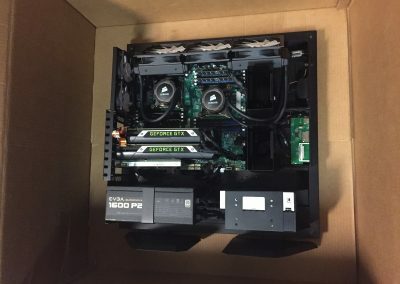 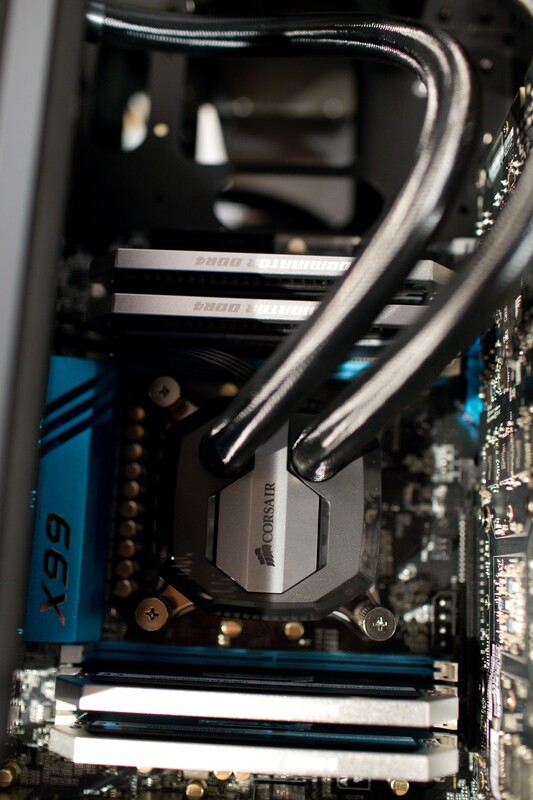 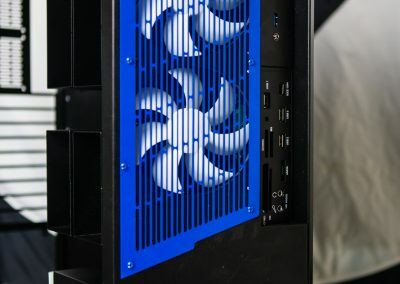 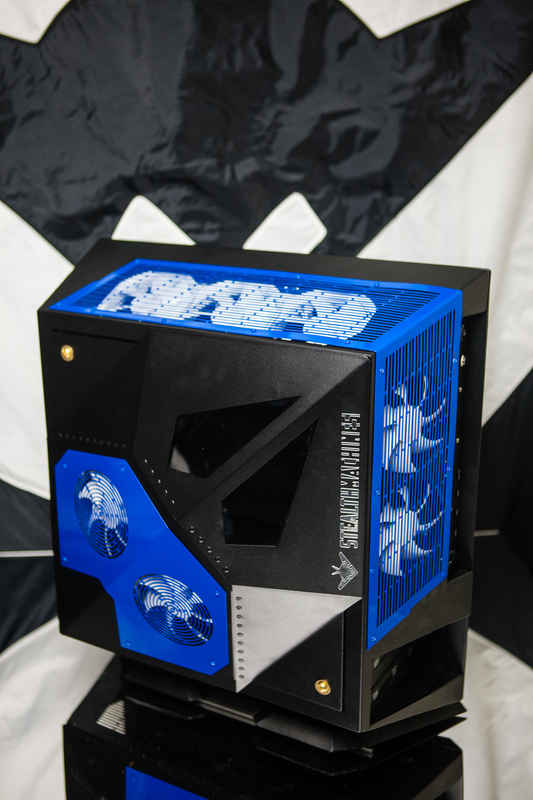 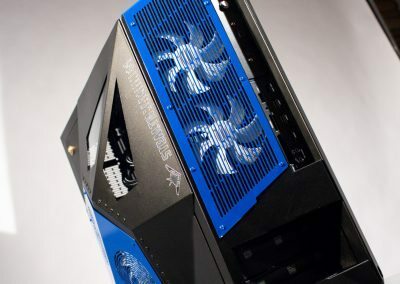 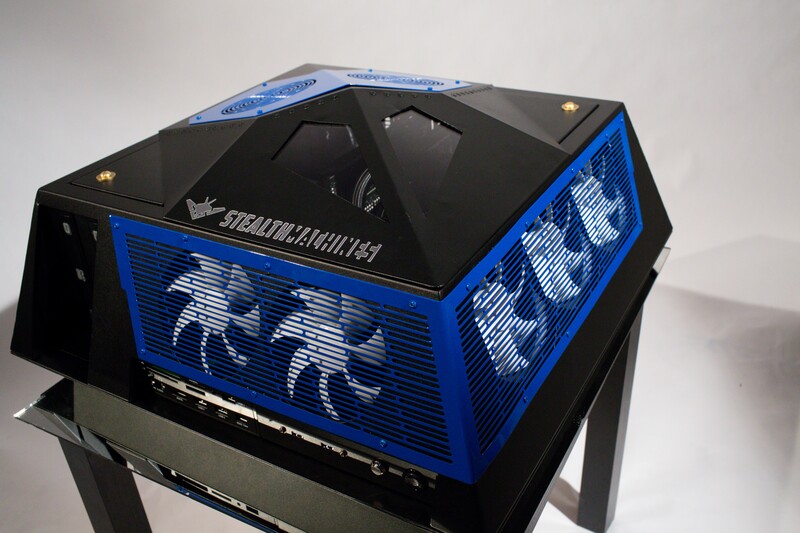 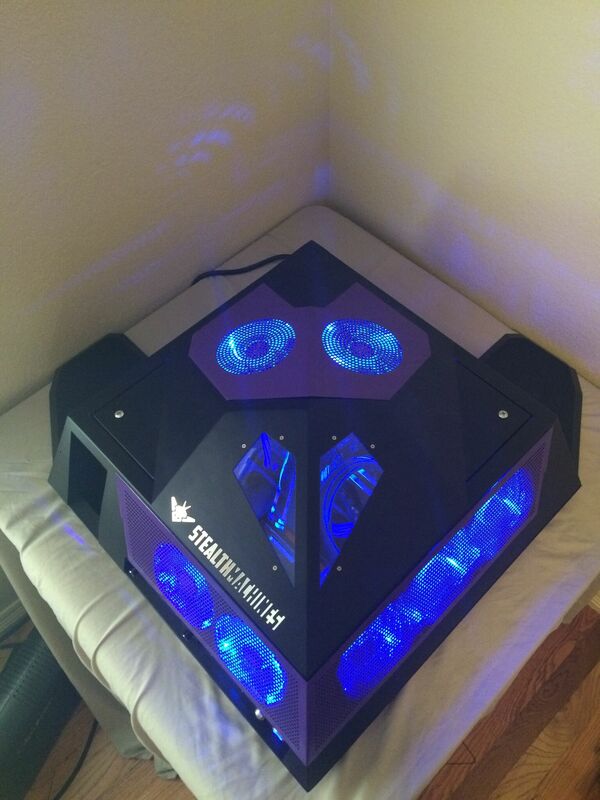 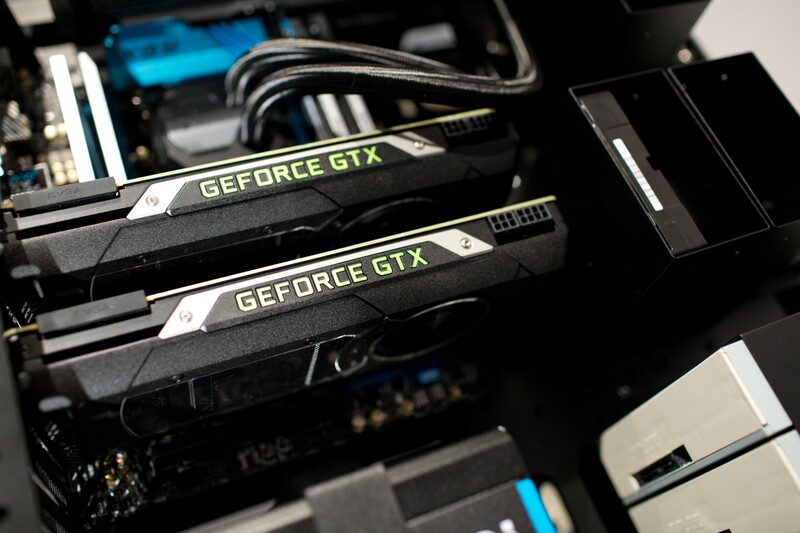 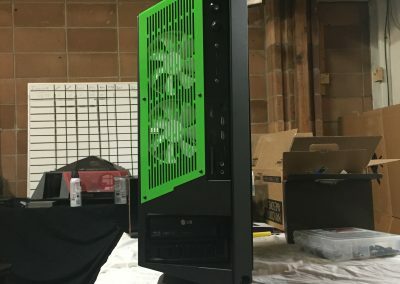 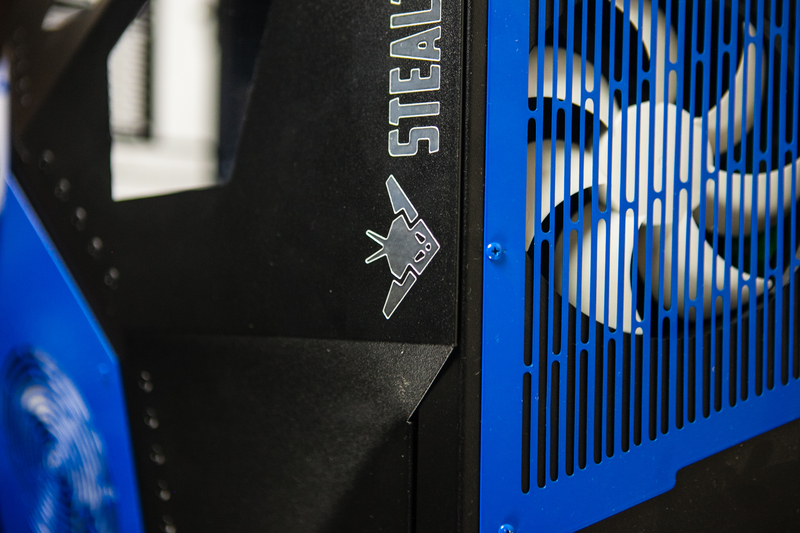 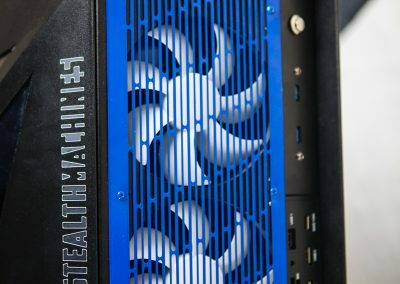 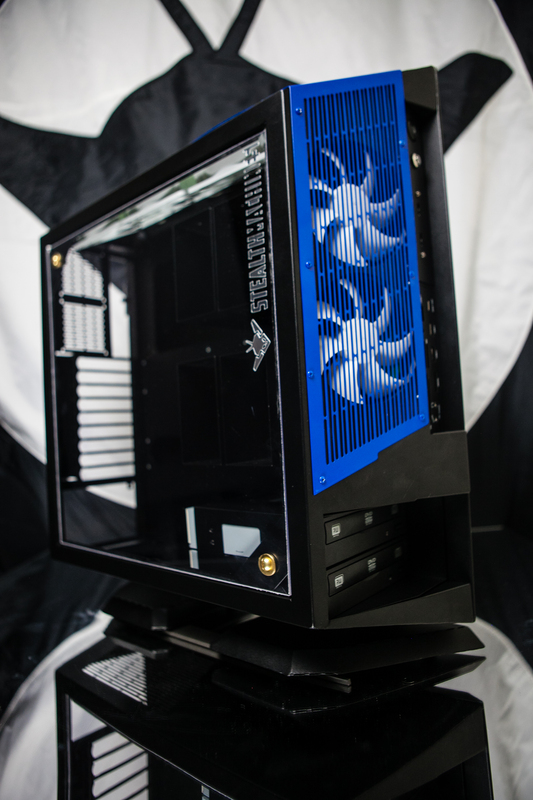 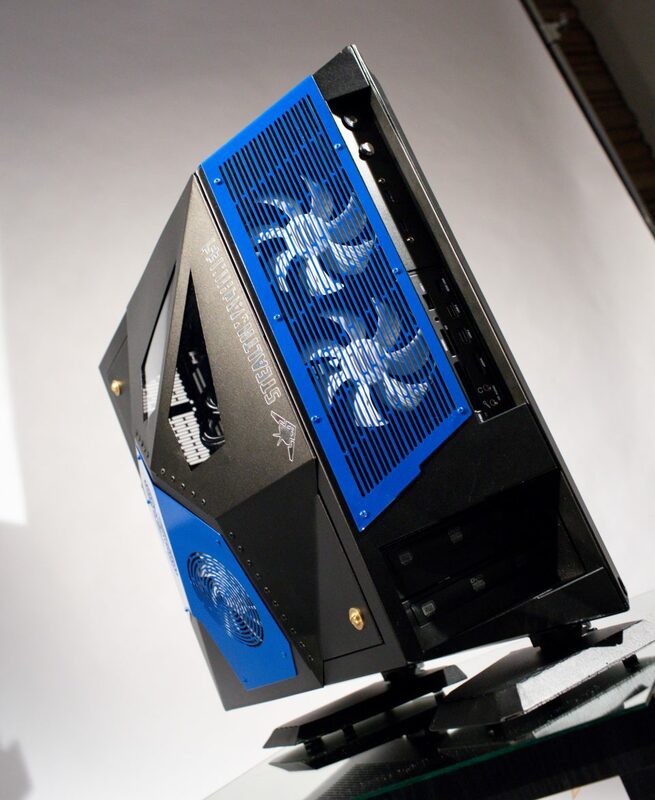 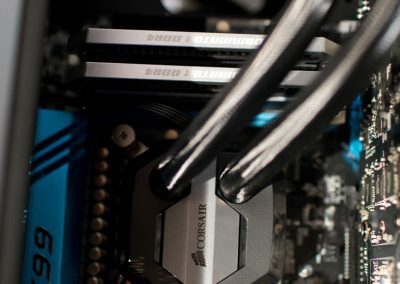 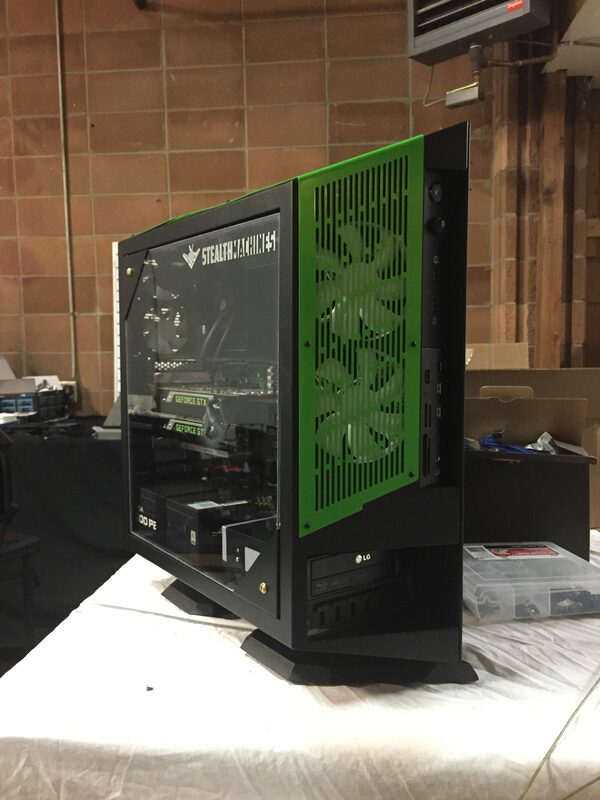 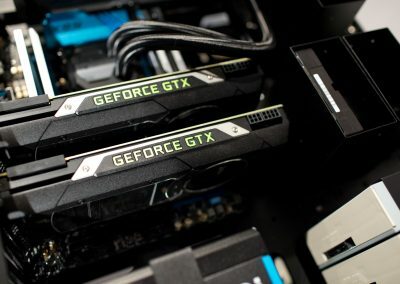 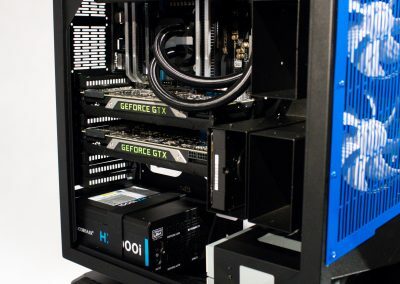 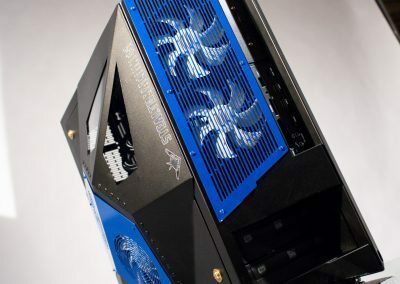 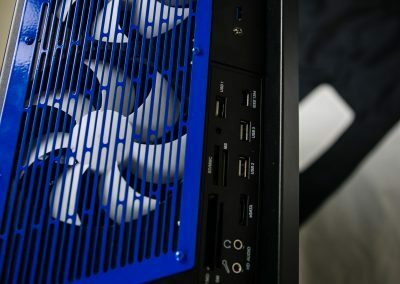 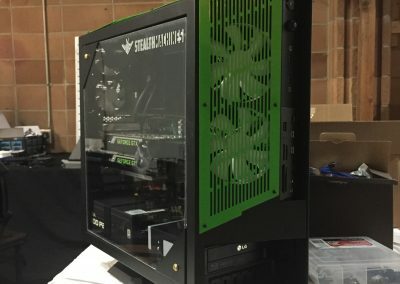 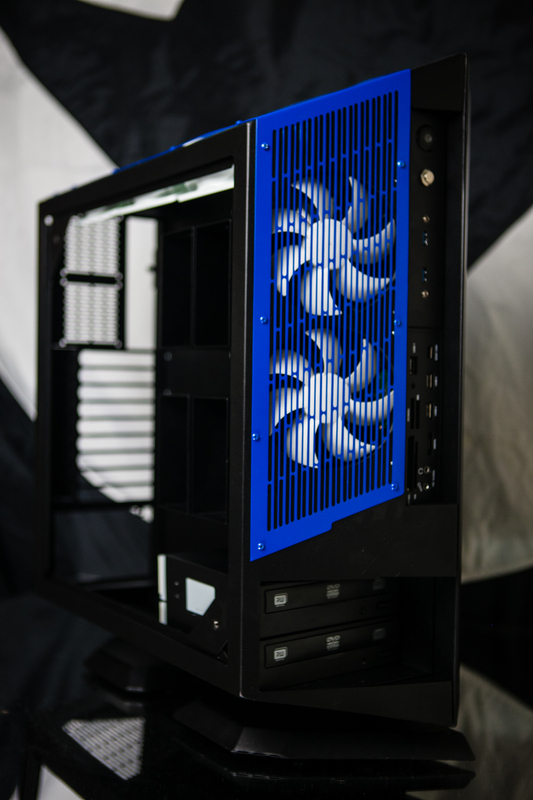 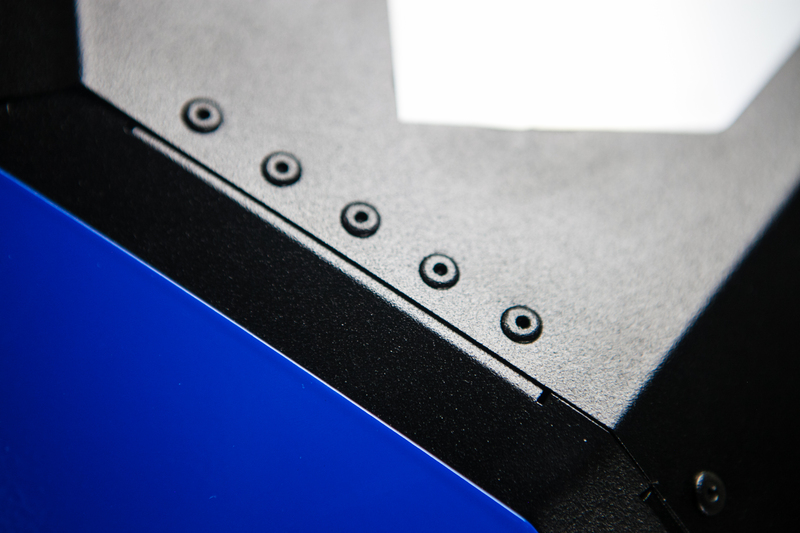 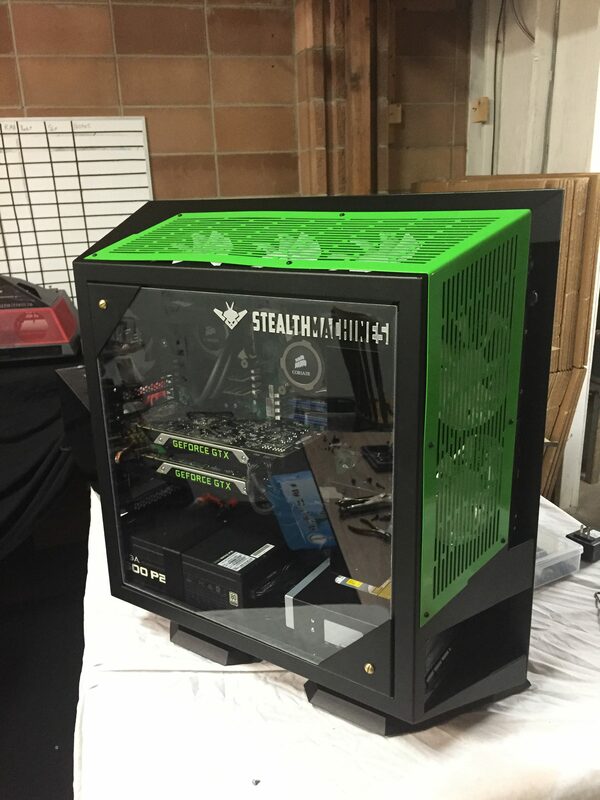 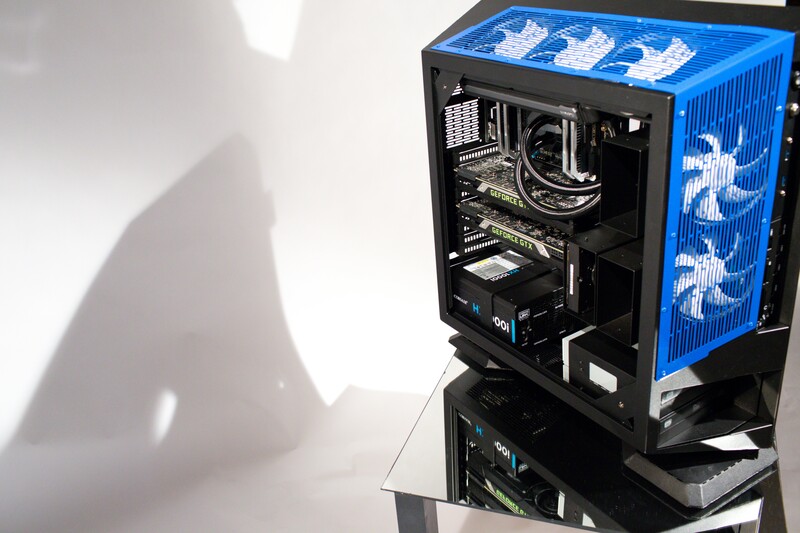 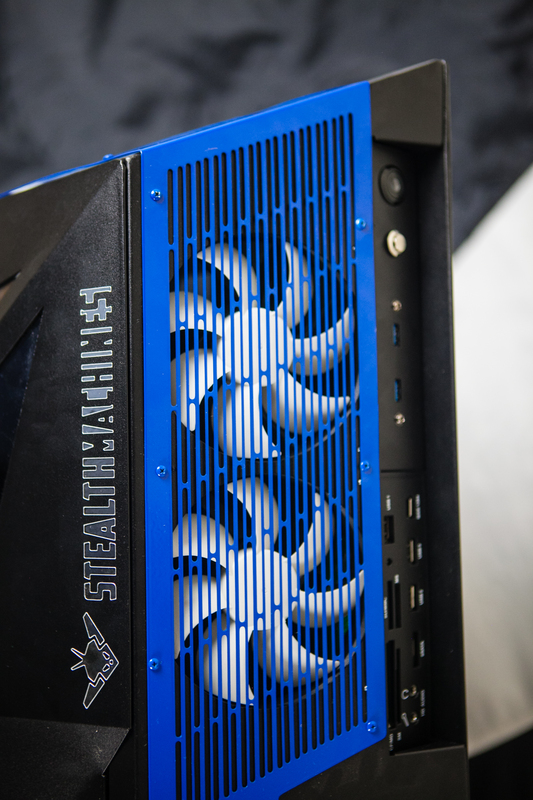 The NightHawk is the sleekest computer case around and is created here in Loveland, Colorado for customers who need the best of the best. 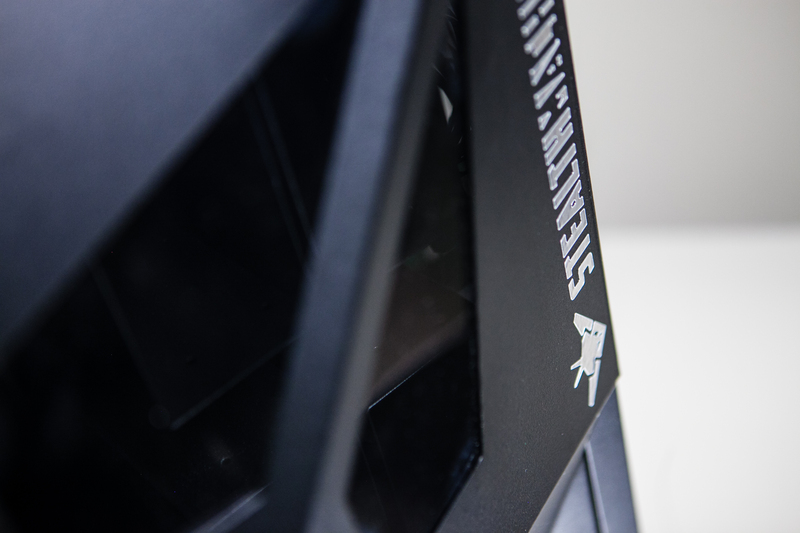 It’s beauty is astonishing and is a must have in the ultimate gamer’s arsenal. 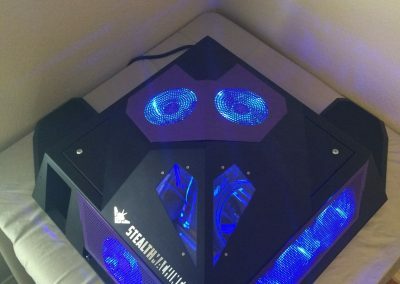 The NightHawk MUST be purchased as part of a computer. 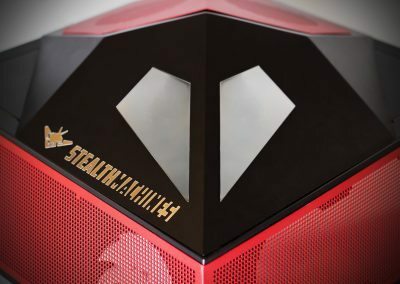 The NightHawk is available in the Espionage, Enigma, and Shadow lines, which can be purchased from here.